Takeda-Shire deal: Japanese expansion in Europe. Takeda is the largest pharmaceutical company in Japan and Asia. Its headquarter is in Tokyo and it is present in more than 70 markets, counting about 30,000 employees worldwide. Its strategy is based on R&D development and since 2015, year in which Christophe Weber became CEO, it has evolved, including the aim to grow through acquisitions outside Japan, thus making the company more global. Prior to his arrival, Takeda bought Nycomed for $14 billion in 2011 in its previous biggest deal. Then, Weber bought U.S. cancer specialist Ariad Pharmaceuticals for $5 billion. Shire is an Irish company, headquartered in Dublin and present in more than 60 countries, with 65% revenues coming from US. It is the rare diseases‐focused leader, committed to differentiated and high patient‐impact medicines. One third of programs is in late phases of development. In March 2018 it became Takeda’s objective for its acquisition strategy. During the deal, Takeda was advised by Evercore, J.P. Morgan and Nomura, while Shire worked with Citi, Goldman Sachs and Morgan Stanley. The rationale of the deal is based on different considerations. First of all, Weber has been hunting for acquisitions to make the company more global and reduce its exposure to a mature Japanese pharmaceutical market since his arrival, and Shire gives him the opportunity to achieve this objective. Shire’s footprint is attractive: the acquisition would allow the combined entity to have 48% revenues coming from US, 19% from Japan and 33% from the rest of the world. The strong R&D department of Shire, moreover, would increase Takeda presence in rare diseases, enlarging the company offer of products and possible range of clients. The transaction would strengthen two of our three core therapeutic areas in gastroenterology (GI) and neuroscience and provide leading positions in rare diseases and plasma‐derived therapies to complement strength in oncology and focused efforts in vaccines. At the end, the combined entity would be based on five core areas: Oncology; Gastroenterology; Neuroscience; Rare diseases; Plasma derived therapies; Ophthalmology, General medicine, Vaccines & Other. Another aim is to create a complementary early and late‐stage pipeline focused on highly innovative medicines. Moving to financial benefits, the deal will be accretive to underlying EPS from the first fiscal year following completion and will produce strong combined cash flows, according to the previsions made by the acquiring company. In the same year, ROIC is expected to exceed Takeda’s cost of capital, thus creating a sustainable growth for the future. Takeda declared that it has intentions to maintain investment grade credit rating and well‐established dividend policy as a key component of shareholder return. EBITDA before taxes is expected to increase, together with revenues and R&D expenditure. Pre‐tax cost synergies are expected to be at least $1.4 billion annually by the end of the third fiscal year following completion. These synergies come from three different sources. First, SG&A, especially from sales and marketing efficiencies, consolidation of overlapping office locations, elimination of duplicate IT systems and reduction of duplicate costs across central support functions. Secondly, R&D, through the rationalization of ongoing research and early stage pipeline programs and the reduction of overlapping resources. Thirdly, from manufacturing & supply, mainly from in‐sourcing Oral Solid Dose manufacturing through Takeda excess capacity, operational procurement spending efficiencies and reduced overheads. Besides this, there is expected potential for additional revenue synergies from combined infrastructure, market presence and development capabilities. Moving to the timeline of the deal, as said before, Takeda’s interest in Shire was firstly expressed in March 2018. This started the rumor phase, during which Shire agreed to sell its oncology business for $2.4bn in cash to Servier, a French pharmaceutical group. The move was seen by some as a defensive tactic to repel Takeda. During the courtship phase, Takeda made four offers to Shire, all rejected with the motivation that Shire considered the company undervalued. Allergan, another Irish company, appeared in the transaction, spreading rumors of a possible future offer to acquire Shire, that however turned to dust after the negative reaction of the market. In the end, the acquisition was agreed at the incredible price of $62 billion. After the announcement, the market reacted underlying both strengths and weaknesses of the deal. Also, a group of shareholders of Takeda, who still have to vote for the consensus to the deal, expressed concerns, mainly about two issues. The dissidents, who have hired a former UBS analyst to back their campaign, had proposed seeking advance shareholder approval for any large acquisition exceeding $9bn. The first issue is the high leverage to which the company would be exposed after the deal, which would make it one of the most indebted drug makers, this fact prompting Standard & Poor’s to warn of a potential credit downgrade. To pay off debts quickly, Takeda plans to cut on jobs and on duplicated drug research. As a further matter, Takeda said $30.1 billion in bridge loan financing will be replaced with a combination of long-term debt, hybrid capital and available cash ahead of completion, without providing a breakdown. There may be also opportunities to divest in certain business falling outside the five main areas. The second issue regards Shire’s lucrative hemophilia franchise, pressured from a new rival drug made by Swiss pharma group Roche, and from experimental gene therapies being developed for the blood disorder by BioMarin, Spark Therapeutics and Pfizer, which are designed to fix the underlying genetic defect that causes the disease. In an interview with the Financial Times, Mr. Weber said Takeda had evaluated the threats before arriving at a £46bn valuation for Shire. The deal is structured as follows. 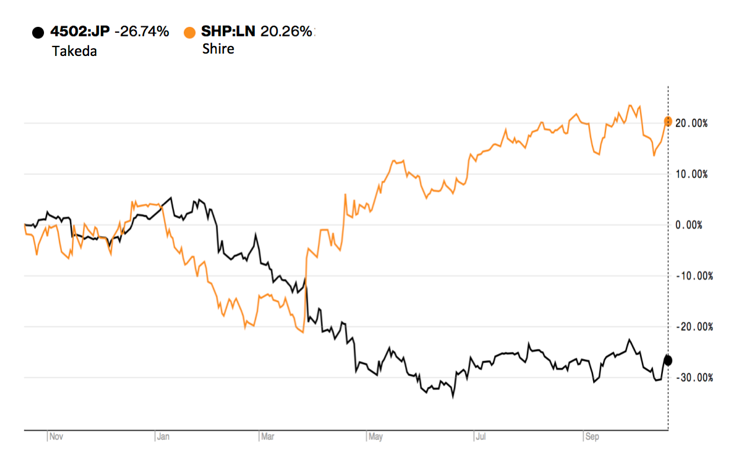 In terms of consideration, Shire shareholders are entitled to receive, per Shire share, $30.33 in cash and either 0.839 in new Takeda shares or equivalent 1.678 Takeda ADSs, for an approximate value of £49 per Shire share, with a premium of 64.4% to Shire’s share price prior to rumors of a possible transaction. In terms of financing, the cash portion will be funded through a $30.85Bn fully underwritten bridge facility, arranged by J.P. Morgan Chase Bank N.A., Sumitomo Mitsui Banking Corporation, MUFG Bank, Ltd. The transaction has received unconditional approval from the U.S. Federal Trade Commission, but remains subject to a number of conditions, including Shire and Takeda shareholder approval and certain customary closing conditions, including regulatory approvals from EU, China, Japan and Brazil. The transaction is expected to close in first half of calendar year 2019. Takeda will trade on TSE and NYSE. The transaction is interesting from different point of views. The pharmaceutical sector is always evolving, with disruptive technological changes and rare diseases are fundamental both from an ethical and a financial point of view. Takeda is the biggest pharmaceutical company in Asia and its evolution in other continents reflects Asia growing importance in global markets. The transaction is therefore a deal to watch, caring both for the finalization of the acquisition and the eventual evolution of the combined company.